As many items as I've been lucky enough to review for this blog, I still feel that I am actually quite unlucky when it comes to new items. I can't even count the number of times I've been to a country that when I've visited, they didn't have anything new, and shortly after I leave, they release a range of new promo items. Or there's always the other times when the re-release an item I've already reviewed. This also doesn't include the times that friends or family were to fly in a burger for me, and they've either bought the wrong item, forgot to get it, misconnected, got hungry and ate, or that one time my colleague brought me a launch day burger from Japan and the maid had eaten it before I arrived at the office...This recent trip to Manila the McDonald's-gods must have been looking over me because the day before I was scheduled to arrive they launched two new sides, Mac 'N Cheese and Cheezy Mashed Potatoes to go along side their ever popular Chicken McDo (Fried Chicken and Rice) menu. Even more of a surprise was that I didn't even need to order the Chicken to be able to try these as they were available ala carte. Even as a 'side' that's still a pretty pathetic amount of food. Although this is the first review I'll be doing for The Philippines, this was the second time I've been there. The first was way back in 2006 when I had a short overnight transit. 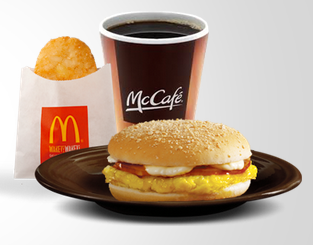 I wasn't writing the blog at the time and didn't even think to step into a McDonald's at the time, so I have no idea what they were serving back then although I have a pretty good idea...it was probably fried chicken. All the branches I peaked into were shockingly busy, and most of the locals were eating fried chicken and rice dishes. They also serve Spaghetti, but I've reviewed both in Indonesia, I didn't have any interest wasting stomachspace trying it again, even if the chicken was served with gravy. The gravy didn't come in a packet, so I couldn't buy it to save for a later date. I ordered the sides on my last day in Manila, which meant they were only available for 3 days. I must have been the first customer they encountered that ordered these ala carte as they ended up calling over a manager to confirm that I did indeed only want the sides, and not any meal. 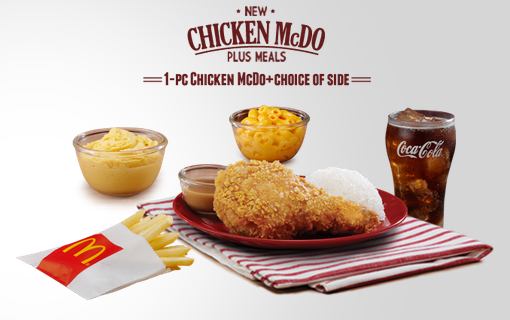 I was shocked by the price, not because it was all that expensive, but since chicken + rice + fries + drink combo was 99PHP where the small cup of Mac N Cheese on it's own was 39PHP, that's almost 40% the cost of the entire meal! I knew these were only intended to be sides, but I was rather let down by the size of the cup. You could tell they re-purposed their gravy cups for these, but there was hardly 3 spoonful of product inside each. Neither was even full to the top, and both were served lukewarm. Not a good start. I started with the Man N Cheese, since it actually resembled what the dish should look like. It must have been made at the start of lunch service, since I ordered these at around 12:45pm, and there was a clear separation between the noodles on the top, and a pool of cheese at the bottom so I gave it a good stir before I took my first bite. Apart from being lukewarm, this tasted exactly like boxed Mac N Cheese should taste with that standard salty and tanginess you'd come to expect. The noodles were also better than you would expect from McDonald's, but that probably has to do with them cooking spaghetti already. I doubt any other McDonald's would be able to get the noodle consistency this perfect. The Cheezy Mashed Potato had a strange, artificial yellow/orange colour which didn't really look like any mashed potato I had tried before. But however it looked in real life, it had to be better than whatever they used in their promotional images (go back to the top of this review to see) where it looked like Cheese Whiz/Easy Cheese in a cup. As strange as the colour was, the consistency was even weirder. It wasn't hard, it wasn't soft, it wasn't even potatoey...it reminded me most of scooping ice cream. For the taste, well, it wasn't horrible, but it wasn't good either. It was pretty easy to tell what they did. They took the powered cheese mix from the Mac N Cheese and mixed it together with whatever was supposed to be potato. If it did indeed use the cheese, I don't know how the Mashed Potato could have been 25% cheaper than the Mac N Cheese. I've travelled to many countries, and I've yet to find one where 3 spoonfuls of macaroni noodles would cost more than potato. 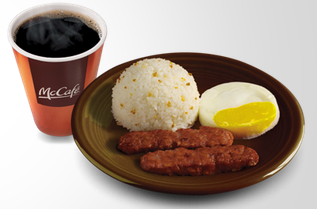 When planning my trip (before they announced these new dishes), I had originally planned on trying the regular-menu breakfast items, "Hamdesal" (Canadian bacon with pineapple sauce served in a Pandesal bun) and the Longaniza Sausage served with Garlic Rice. I probably should have gone with my original plan since they both look better than these new sides ever could have been. We only had 1 morning in Manila, so they'll have to wait until next time. You should try the spaghetti in Philippines. Philippine spaghetti is different in that it's sweet and usually includes pieces of hot dog in the sauce. I'm pretty sure it would be a different experience than in Indonesia. I am from the Philippines but I now live in Malaysia. The fried chicken in these two countries are worlds apart. I've been to Indonesia and tried the spaghetti as well and it is very different. It can't be assumed that because they're both McDonald's and the same menu item they will be the same as I travel a lot between these countries. You should try the fried chicken and spaghetti next time from the Philippines as well as the one in Malaysia!